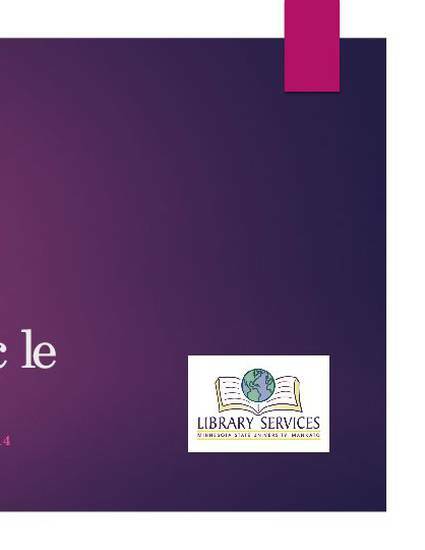 This session is geared towards library staff who would like to increase practical knowledge about collection development and management of DVDs and streaming videos. Video selection includes identifying videos of interest, forming relationships with vendors, issues of pricing, licensing, and copyright fair use versus public performance rights. Video processing involves the steps in providing access to videos through cataloging for local consumption. This includes decisions such as genre and subject heading choices, classification decision, special interest MARC fields. We'll also speak briefly on decisions about packaging, shelving, circulation, weeding, and preservation. Bergman, B, Schomberg, J., & Kurtz, D. (2014, October 8). The Video Lifecycle: Selection and Processing of Video Collections. Presented at the 2014 Minnesota Library Association Annual Conference, Mankato, MN.